I’m jumping on an airplane bright and early Wednesday morning to fly into New Orleans for the first of Aquarium Drunkard’s three Jazz Fest shows this week. We’re kicking off Wednesday night with the unfuckablewith Jon Spencer Blues Explosion at One Eyed Jacks. We have three pairs of tickets to the rock show for the Aquarium Drunkard faithful. To enter for a pair leave a comment below with your name, a valid email we can reach you and you top Blues Explosion jam. Winners chosen at random and notified Tuesday night. JEFF The Brotherhood supports. Identify! Identify! I’d like to get a pair of those tix to see JSBE in New Orleans! I’m totall “random” choose me! In a city intoxicated for two weeks on every addicting genera of music I’d love to buy the aquarium drunkard a stiff drink at One Eyed Jacks on May 4th. 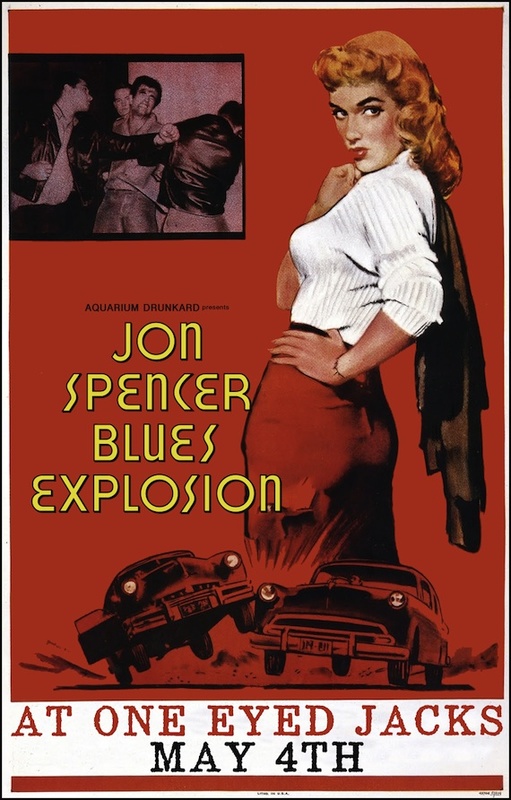 Besides, I might just implode if, i dont see Jon Specer Blues Expolsion. Rock and Roll CAN save my soul! My middle name is Random! Wail!! !